SCVHistory.com LW2955 | Historic Placerita Canyon Movie Ranch Locations. Early movie ranch locations in Placerita Canyon, extrapolated from Schneider 2011:512. Google map shows The Walt Disney Co.'s Golden Oak Ranch as of April 2017. Walt Disney used the area identified in yellow as the Golden Oak Ranch in the 1950s and subsequently acquired the other movie ranches shown. Disney's current Business District set (as of 2017) is in the approximate location — maybe the exact location — where Ernie Hickson set up Trem Carr's Western street set in 1931. Carr leased the area identified as the Trem Carr Ranch (Trem Carr Pictures Ranch) for five years from from 1931 to 1936. When his lease expired and the rate went up, Carr and Hickson moved their movie town down Placerita Canyon Road to a ranch that Hickson purchased around 1932 and eventually grew to 110 acres. It was known colloquially as the Monogram Ranch because Monogram Pictures Corp. (Carr and W. Ray Johnston) was the primary leaseholder until 1941, when Hickson renamed it Placeritos Ranch. 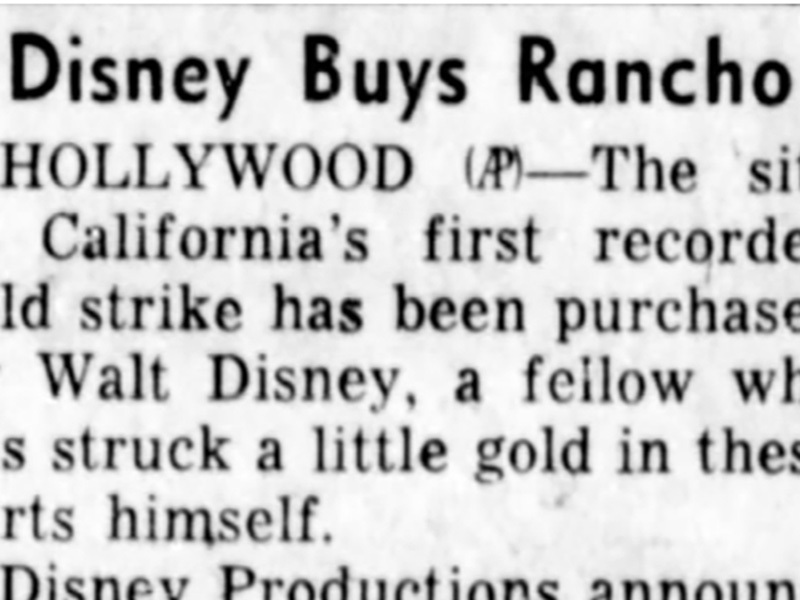 After Hickson's death it was sold to Gene Autry, who renamed it Melody Ranch. When Alexander Mentry came out west in 1873 to drill for oil in Pico Canyon, he lived on a 180-acre estate in Placerita Canyon. It has been reported that this property was what became Andy Jauregui's ranch. More investigation is needed on this point. LW2955: 9600 dpi jpeg. Layered Photoshop file on server for editing as needed.